McCloud River oil tank car #2000 behind the Pondosa shop. Dennis Sullivan collection. Oil started replacing wood as the fuel consumed by the steam powered logging and railroad eqipment owned by the McCloud River companies in the first decade of the 1900's. The shift created demands for new storage and transportation equipment. In 1907, the railroad built a 5,000-barrel capacity oil storage tank on the hillside west of the yards and shops in McCloud and started purchasing tank cars to transport oil. The roster gradually expanded through the years, with cars added or modified to handle gasoline and diesel fuel as the McCloud companies adopted internal combustion. The below roster includes those cars used to handle oil and other liquid fuels. Most of these cars did not stray from McCloud rails. The only exception would be the 2000-series American Car & Foundry tank cars, which regularly made round trips from McCloud to the oil fields aroung Bakersfield, CA, to get loads of oil for return to McCloud. The railroad never changed out the arch bar trucks underneath the cars, which eventually caught up to the company. In February 1936, the railroad interchanged cars #2002 and #2004 to the SP, who took them to the Bakersfield area. On the return trip, one of the trucks under car #2002 failed, leading to a derailment that injured the two SP crewman riding on the caboose. Whether this derailment ended the off-line use of these cars or not is unknown; however, Federal regulations banned all cars riding on arch bar trucks from being interchanged in 1941, which ended the off-line use of these cars anyway. Oil shipments thereafter arrived in McCloud in foriegn road tank cars. 429: Gasoline tank, wood frame. Converted 1920 from lumber flat #429 by installing a 16-foot long gas tank. Retired 1940. 1707: Oil car, wood frame, unknown tank. Converted 1920 from fire car #1707. Converted 1935 to water car #2057. 1785: Oil tank, built 1929 in the company shops. Retired 1940. 1817: Gasoline car, all wood. Converted 1927 from water car #1817. Retired 1940. 1829: Gasoline car, all wood. Converted 1928 from water car #1829. Retired 1940. 2000: 8,000 gallon, 33-foot steel tank car. Built 1907 by American Car & Foundry, Niles, Ohio. Purchased new. Rebuilt 1926 with a new depreciation schedule. Original K- brakes replaced with AB brakes 1946/1947. Converted to water service in later years. Dismantled in Burney, with tank body leased 7/1963 to Morrison-Knudson for Pit 6 and 7 dam building projects. 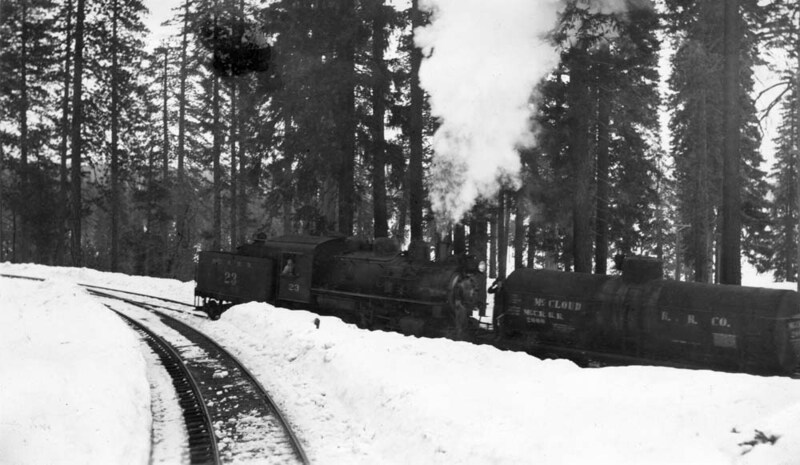 Locomotive #23 with tank car #2000 in the woods, probably in the late 1930s. From the T.E. "Eddy" Glover collection. 2001: 8,000 gallon, 33-foot steel tank car. Built 1907 by American Car & Foundry, Niles, Ohio. Purchased new. Rebuilt 1926 with a new depreciation schedule. Original K- brakes replaced with AB brakes 1946/1947. Power brake installed 1958. Converted to water service in later years. Sold 1966 to U.S. Plywood. 2002: 8,000 gallon, 33-foot steel tank car. Built 1907 by American Car & Foundry, Niles, Ohio. Purchased new. Rebuilt 1926 with a new depreciation schedule. Original K- brakes replaced with AB brakes 1946/1947. Converted 1957 to sand car #503. 2003: 8,000 gallon, 33-foot steel tank car. Built 1907 by American Car & Foundry, Niles, Ohio. Purchased new. Rebuilt 1926 with a new depreciation schedule. Converted 1940 to a "Cat Car" by removing just shy of one half of the tank body and replacing it with a large storage box. Capacity of tank reduced to 5,200 gallons. Car carried diesel fuel and cat parts and was mated to one of the two tool cars (#1983 or #1733:2) to support field repairs and servicing of logging tractors in the woods. Install power brake 1959. Dismantled and sold to Morrison-Knudson. #2003 and tool car #1733 at Camp Kinyon in 1962. Henry W. Brueckman photograph, Jack Neville collection. 2004: 8,000 gallon, 33-foot steel tank car. Built 1907 by American Car & Foundry, Niles, Ohio. Purchased new. Rebuilt 1926 with a new depreciation schedule. Converted 1940 to a "Cat Car" by removing just shy of one half of the tank body and replacing it with a large storage box. Capacity of tank reduced to 5,200 gallons. Car carried diesel fuel and cat parts and was mated to one of the two tool cars (#1983 or #1733) to support field repairs and servicing of logging tractors in the woods. Power brake installed 1957. Retired late 1969/early 1970. 2005: 8,000 gallon, 33-foot steel tank car. Built 1907 by American Car & Foundry, Niles, Ohio. Purchased new. Rebuilt 1926 with a new depreciation schedule. Original K- brakes replaced with AB brakes 1946/1947. Rigged for jammer (McGiffert loader) service in later years. Retired late 1969/early 1970. 2006: 8,000 gallon steel tank car. Purchased 1926, probably new from American Car & Foundry. Converted 1936 to water car #2059. 2007: 8,000 gallon steel tank car. Built 1909 by AC&F, Berwick, IL. Converted 1951 to fire car #1713. 2008: 8,000 gallon steel tank car. Purchased 1928. Rigged for jammer (McGiffert loader) service in later years. Power brake installed 1959. Retired circa 1968. 2009: 8,000 gallon steel tank car. Built 1909 by AC&F, Berwick, IL. Converted 1951 to fire car #1715. 2010: 8,000 gallon steel tank car. Purchased 1928. Appears to have been a former Gulf Refining Company car. Rigged for jammer (McGiffert loader) service in later years. Power brake installed 1957. Used to store oil for #25 on shop tracks from circa 1962-1977, then converted 1977 to fire car #1716. 2011: 8,000 gallon steel tank car. Built 1909 by AC&F, Berwick, IL. Replace original K- brakes with AB brakes 1946/1947. Retired late 1969/early 1970. 2021, 2023: 6,000 gallon steel tank cars (wood frames), oil/fuel service. Built 1920 in McCloud carshop. Retired 9/1940. Tank from one of these cars likely re-used in fire car #1711. Oil car #2023 spotted next to a McGiffert loader. Dennis Sullivan collection. 2331- Converted from tie flat #2331 prior to 1959. Disposition unrecorded, but may have been converted to fire car #1716.